So after meeting the lovely Louisa from Dylon at the Miss Selfridge press event, they asked if I'd like to do some tie dying myself. After a fairly successful dip dye on a pair of white jeans at the event I wanted to do some more dip dye/ombre and also tried my hand at tie dying. I am not a natural 'dyer' and found the whole thing quite messy, especially in our student kitchen, but it is super easy and if you want to update any home or wardrobe items this is the way to do it! 1. Wash fabric thoroughly. Leave damp. If tie dying, wrap elastic bands around the selected areas. 2. Using rubber gloves, dissolve dye in 500ml warm water. 3. Fill bowl/stainless steel sink with approx 6 litres warm water. 4. Stir in 250g (5tbsp) salt. Add dye & stir well. 5. Submerge fabric in water. 6. 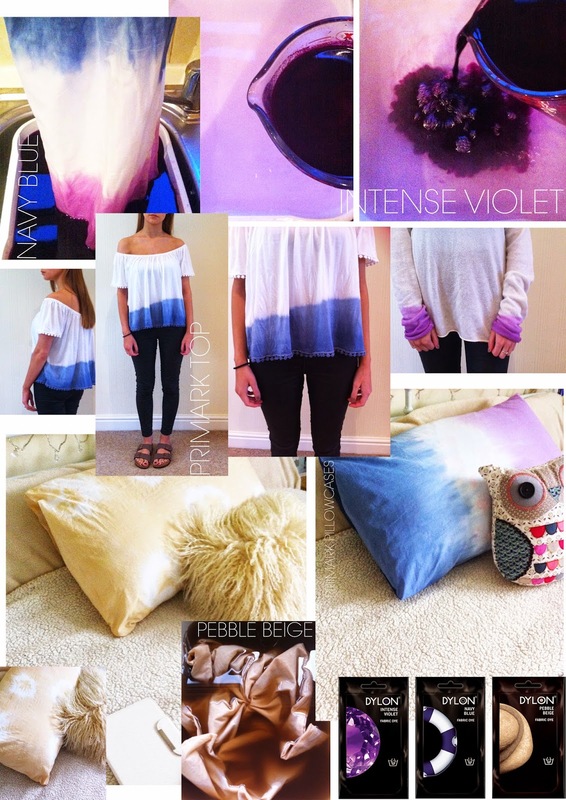 Stir for 15 mins then stir regularly for 45 mins for tie dying or dip fabric into dye up to the level you desire. 7. Rinse fabric in cold water. Wash in warm water & dry away from direct heat & sunlight.